You will find many ways on the internet, on "how to" take care of this animal. This care sheet is showing the way we found works best for us from our years of experience of caring for this species. Horny Toad lizards are from the hot dry southwest. They have perfect camouflage for rocky places. They are not huge climbers but will climb low lying branches and decor. Floor space is more important than height in your lizards enclosure. We recommend at least 30" x 12" tank or a 18" x 18". Exo Terra's Small or Zilla's 20 long critter cage. These lizards are communal and seem to do fine in each others company. We would not suggest mixing them with other species of lizard. They are not aggressive enough feeders and the other lizards would eat all the food. Horny toad lizards like to dig and do fine in natural sand, e.g., play sand or Exo Terra sand. Just don't make it too deep or you will never see them. Do not use calcium sand as this can clump in your lizards gut and cause impaction. We suggest approximately one inch depth. Also be sure to give your lizard a couple different places to hide. Some ideas are the Exo terra rock hides or skulls. Horny toad lizards like it hot during the day. A 100-105 degree basking spot is good. However, like all reptiles they are dependent on thermoregulation to control their body temperature. So you still want to provide a hot and cool side to your enclosure. All the heat elements should be on one side and the other will be the cool side. The easiest way to increase the heat in your enclosure is with a reptile heat light and an Exo terra or Zoo Med heat pad placed on the outside underneath the enclosure. Turn the light off at night and leave the heat pad on 24/7. The rest of the enclosure can be in the 72-75 degree range. At night, temps can drop to as low as 70 degrees. Use a good quality temperature gauge, like Zoo Meds digital temp gauge or Exo Terras Thermometer. Horny Toad lizards need UVB lighting to help them absorb calcium and to synthesize vitamin D3. Since they are not out in natural sunlight in our homes, we must provide UVB light in the form of a special fluorescent bulb designed to produce UVB rays. The best bulbs are the mercury vapors such as Exo Terra's Solar Glo bulbs, ZooMed's Powersun, or Solar bright bulbs. These provide heat and UVB all in one bulb. You can also use separate basking (heat) bulb and UVB bulbs. If you use these you will want the Zoo Med 10.0 or Exo Terra 150 desert variety. In colder climate areas, your lizard may need extra heat in the winter to keep them from brumating. You can achieve more warmth by adding an extra heat lamp, or depending on the temperature in your home, you may be able to get away with something as simple as putting a folded towel over half of the enclosure (away from your heat fixtures). 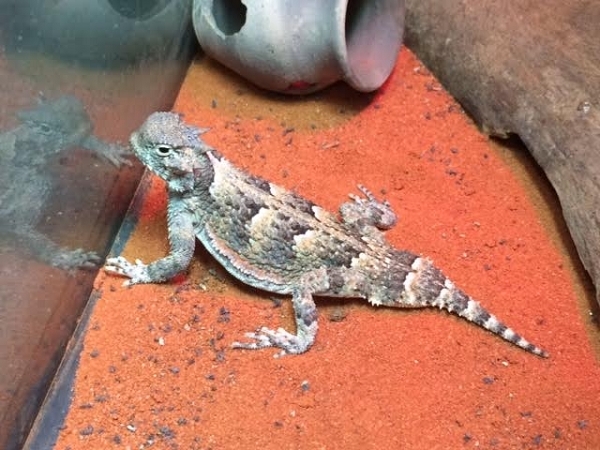 Keep a non porous water bowl in with your horny toad lizard and make sure it always has clean water. Exo Terras water bowls or Flukers water bowls are good choices. You might have to change the water out everyday if your lizard likes to defecate in it. Scrub the bowl at least once a week to keep bacteria slime from building up. Horny toad lizards are mostly harvester ant eaters. In the wild, they will eat up to 100 ants a day. They will accept small crickets in place of the ants. However, we recommend giving them a formic acid supplement a couple times a week, like Repashy formic cal plus supplement if you are not going to feed them ants. These lizards do not like to chase down their food and will hang out at anthills ready to pick off the ants that come out. This means it is helpful if you drop the bugs in the same spot of the enclosure every time. They will get to know where the food comes from and hang out there. You also want to supplement the bug diet at least every other feeding with calcium such as Zoo Med calcium with D3. A Horny toads defense is to squirt blood out their eyes. However, they have to be really scared to actually do this in captivity. They'e not big on being handled; when they are, the lizard will usually remain stiff and quiet in your hand. This means they're not very happy and are just waiting for a chance to bolt back to safety. You can hold them some, but frequent handling is not recommended. If you provide the correct environment, they can be quite an entertaining pet.